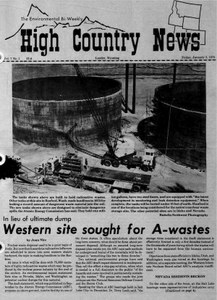 Nuclear waste disposal used to be a quiet topic of study. But now that hazardous radioactive leftovers are scheduled to move into Nevada, Idaho, or Washington, the topic is making headlines. N. Great Plains report: preview of disaster? Coal development in the Northern Great Plains already seems to be progressing at a level higher than anticipated when the Northern Great Plains Resource Program completed its draft interim report last fall. Sagebrush: Shall we praise or eradicate it? HCN responds to readers after recent article sparked a wave of questioning about the dynamic between sagebrush and grass, wildlife and livestock.